This fairy-tale garden furniture set for kids is sure to add a little magic to their play time. 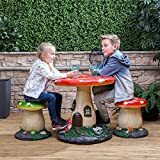 The table is designed to look like a traditional forest mushroom with a bright red and white spotted top, while the base features all the details of a fairy’s house – tiny windows, a door and even a little garden path. The stools are also shaped to look like mushrooms in red and green, both with white spotted tops. The base of each piece is decorated with painted flowers, stones and smaller mushrooms for a cute, colourful finish. Each stool is formed in one solid piece, while the table comes in two parts. The table top has a twist mechanism to secure it to the base, which locks firmly to make sure it’s stable and safe to use. The edges are all rounded and smoothed to protect small hands during play. We recommend this furniture for children aged 3 years and older. The set is made from glass fibre reinforced cement, ensuring a strong sturdy set that can cope with lots of use. The wipe-clean surface means it’s easy to care for and will stay looking its best for longer. Ideal for indoor and outdoor use, so your children can enjoy all year long. We recommend storing inside during bad weather or covering when not in use outdoors.